Is your grip holding back your bench press? Check out these tips on using open grip vs close grip for benching power and strength. How Much Ya Bench, bro? The number of times this question has been asked between guys is probably in the billions. The barbell bench press is one of the “Big 3” exercises (aside from squats and deadlift) and is without a doubt the most popular exercise among men. How much you bench is a measure of your strength, power, and overall manhood. A big bench gets you the gains and, sometimes, the girl. Lack a big bench, and you can forget em both! So, it’s time to get under the bar and start benching! But before you start to press for success, make sure your bench press grip is right. The wrong grip could set you up for poor performance, mediocre gains, and potentially life-threatening consequences. Check out these tips on fixing your grip and increasing your bench press from certified personal trainer Alex Keller. This video is Powered by NutraBio PRE Workout. Don’t Bench without it!! 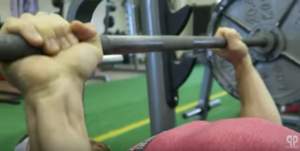 Bench Press Grip Tips: Should I do Suicide Grip? A popular grip with many weightlifters is the open grip, otherwise known as the “suicide grip.” The reason the open grip isn’t the best grip has to do with a little something called the kinetic chain – a series or “chain” of joint actions that are working together that will power you through a particular movement. Take a look at the Kinetic Chain in Alex’s Bench Press Grip. Way less energy/power lost at the wrist action! When using an open grip, the bar is held towards the top of the palm, closer to the fingers moving the wrist into extension and taking it out of its neutral position. The reason you want to switch to a closed grip (thumbs wrapped around the bar) is that your wrist is in a more neutral position, allowing for more leverage, strength, and performance in the bench press. Basically, by using a closed grip, your wrists are more in line with the elbow joint which will allow for a straighter bar path during the bench press. Your power goes straight up through the bar with no energy/power lost at the wrist level… and fewer wrist injuries too! Oh, and dare we mention that closed grip is safer, with you less likely to drop the bar on yourself! There’s a reason they call open grip “suicide grip”, after all! The video above was sponsored by NutraBio, our site’s most trusted supplements. If your bench has hit a plateau, try getting fired up with the upgraded NutraBio Pre Workout! You won’t regret trying this stuff! 6 Comments | Posted in Weight Lifting, Workout Videos | Tagged Bench Press, Chest Workouts, Exercise, NutraBio.